The goalkeepers and defenders have already been announced and now second year head coach John Thompson is excited about the offense that this year's midfielders and forwards will produce. "I think this year's squad has more talent and depth than the 2017 squad," said Thompson. "Last season we had a first class back line and goalkeepers. Up front we looked dangerous with four quality strikers but we suffered multiple key injuries to central midfielders. "This year, we have six players just as capable of playing center back and center mid, so we will not have the issues that we did last season," Thompson added. "Our depth is impressive in every position and in PDL it’s the team with the deepest squad that often prevails come playoff time." The Nor'easters will need the extra offense to compete with a stacked Mid-Atlantic Division. teams sending multiple players into the MLS Draft. This season, I expect the conference to be a little more balanced with more teams taking po intsfrom each other than last year. It’s going to be an exciting three months of football and I hope that people come out and watch the best young talent around compete over the summer down in Ocean City." Bennati made a big impression in his freshman year at Belmont Univerity. The Italian led the team in goals (3) and started all 16 games while being named the Horizon League Freshman of the Year. Prior to signing with Belmont, Bennati played his youth soccer at the Genoa FC academy in Italy. "Matteo is a dynamic footballer who is as quick with the ball as he is without it," said Ocean City Nor'easters head coach John Thompson. "He has the ability to glide past defenders and make it look effortless. He is an elusive player who will be difficult to mark and has proven that he can dominate games at the college level." After redshirting his freshman year at ACC powerhouse Louisville, Bennett thrived this past season in his inaugural season with the Cardinals, playing in all 20 games (19 starts). The lone goal he scored was a game-winner on the road against the University of Charlotte on Oct. 17. He helped the Cardinals finish with a 13-2-5 record in the ultra competitive Atlantic Coast Conference (ACC), and finished ranked No. 7 in the country. Louisville reached the Elite Eight in the NCAA tournament before falling in penalty kicks to another powerhouse, Akron University. Before arriving at Louisville, he spent most of his life in the renowned Leeds United youth academy. He was named the Under-16 Player of the Year at the club, and he later played against Chelsea FC in the FA Youth Cup at Elland Road (Leeds United's home stadium). "Liam is a rock solid footballer who played as a center back for the Leeds United Under-18s before moving stateside," said Thompson. "He showed his flexibility as a quality footballer while at Louisville this past fall. He is very composed with the ball and retains possession very well, and his range of passing is typical of a top quality English center back. He is going to be a great asset for us as he has the ability to play center back and center midfield this summer." After Gurrieri spent his freshman year at Syracuse in 2016, he decided to embark on a new challenge in Sweden. The U.S. youth international (U-14, U-15, U-17), signed with Nordvärmland FF, a team in the Swedish Second Division. After returning stateside, Gurrieri hopes a successful season with the Nor'easters could help get the attention of pro scouts in the U.S. After the PDL season, he plans to attend the University of South Carolina. "Kyle is a box-to-box center midfielder with a great all-round game," said Thompson. "He was one of the top recruits coming out of high school, so he has a good pedigree and I am excited that we have a player of his quality down in Ocean City this summer." Hemmings returns to Ocean City for his second season after playing in 10 games for the Nor'easters in 2017. At Georgia State this past season, Hemmings played in 19 games (starting 18) and finished third on the team in goals with four for a team that is among the nation’s top offensive teams. The junior also joined teammate Frank Rosenwald as the first two players in Georgia State history to be named to the CoSIDA Academic All-District Team. Hemmings was a success in the classroom with the third highest GPA on the district team. Ismail Kaya returns for his second season with the Nor'easters. Last year, he enjoyed limited playing time in what was a talented and crowded midfield. He was a high school teammate of Matt Fahey at Williamstown High School where he dished out 12 assists during his senior season. "Ismail had a great couple of games for us toward the end of last season. He is dynamic on the ball and has the ability to create time and space to deliver crosses," said Thompson. "He played for me since he was a 14-year-old in club soccer and, in my opinion, was the most creative players to come out of South Jersey in the past 10 years. He just never knew when and where to use that skill. Now that he has matured, he has simplified his game and uses his creativity at the right times. His soccer IQ has finally caught up with his natural ability and he will push for a starting job at left wing or left wing back this year. Korb joins Ocean City after helping Akron University reach the College Cup Semifinals last season as a defender. The Willowick, Ohio native started his college career at Mercyhurst College where he played two seasons before transferring to Akron where he was part of a defensive unit that earned 12 shutouts. Korb dished out two assists in 11 games as the Zips' season came to an end in the final four against the nation's No. 1 team and eventual national champion Stanford. "Joe is a dynamic right winger who has pace, power and is very direct," said Thompson. "He loves to run at defenders and get in behind. I really like his energy and range up and down the right hand side. Joe's energy and fitness allows him the flexibility to play right back, right wing or right wing back." Lasarte has made a mark on the Fairleigh Dickinson University (FDU) program in his first two years. In his freshman year, he was named to the Northeast Conference All-Rookie Team. Last year, in his sophomore year, he followed that up with four goals and five assists and a spot on the All-Conference Second Team. Along with FDU and Nor'easters teammate Fredinho Mompremier, the Knights finished the season 10-5-3 with an impressive 7-1-1 record away from home. McCormick comes to Ocean City after impressing at the Nor'easters' open tryouts and having a successful freshman season at Holy Family University in Philadelphia. McCormick started all 15 games he played in and leading the team in scoring with four goals. "Sean was one of the most dynamic players at our open tryouts last year and he really caught my eye despite only being a senior in high school," said Thompson. "I think he deserves the opportunity to see if he can raise his game at the next level. He is very quick and elusive on the pitch and distributes the ball with intelligence." McLaren, along with fellow Nor'easter defender Uros Ilic, helped Missouri Valley College to a great season that saw the team finish as the national runners-up, and ranked No. 2 in the nation. McLaren was named to the All-American Second Team after finishing the season with three goals and one assist. He was one of three players to start all 25 of the team's games this season. "James is a rock at the base of the midfield who imposes himself on every game with his physicality and athleticism," said Thompson. "James is the anchor in which you can build the rest of your team around and we look forward to seeing him dominate the center midfield this summer and allow our creative players the freedom to go express themselves." After a remarkable career at La Salle College High School that saw him named the 2016 Southeast Pennsylvania Player of the Year, Patton stepped into one of the country's elite programs at the University of Virginia. The Cavaliers had another great season, finishing with a 12-4-5 record and losing the ACC championship game in penalty kicks and making another trip to the NCAA touranment. Patton redshirted and is working toward earning playing time at one of the ACC's powerhouses. "Spencer is a natural lefty and is very attacking minded. He has been getting a good amount of minutes this spring and will compete for time in Ocean City as a left winger or left midfielder," said Thompson. "Spencer has been on our radar for several years and he came out to train with us as a high school student back in 2015 and 2016, so its great to see him now make the roster." After a solid freshman year at Florida Tech, Smalley made great strides last fall in his sophomore season. He was the only sophomore to be named First Team All-Sunshine Conference and he was also named to a pair of All-Region teams. He scored seven goals and seven assists in 14 games, which ranked second in the conference in scoring and he led the conference in points per game (1.5). "Brandon caught my eye in the several games I watched this fall," said Thompson. "He is very technical and pings a great ball. His delivery into the box always hits its target and he has the dribbling skills to create time and space for that delivery. He has the capacity to play several positions wether it be on the wing crossing balls, as a No. 10 picking out passes or as a center mid spraying balls around the pitch." Spielman returns to the Nor'easters for a second season after starting all 18 games for East Tennessee State University in 2017. The Buccaneers of ETSU only lost two games all season, finishing with a 9-2-7 record. The Bucs finished the regular season on a 10-game unbeaten streak (6-0-4), which were all conference games. Spielman scored three goals and added one assist (7 points), which was tied for the third-most points on the team. Their unbeaten streak extended into the postseason where they were the top seed in the conference tournament, but lost in a penalty kick shootout after a scoreless draw with Mercer. Spielman was named to the All-Tournament team, and was named to the All-Conference Second Team for the season. Tellechea, the Nor'easters Creative Player of the Year and third leading scorer (5 goals, 1 assist) from last year, returns to Ocean City for a second season. After winning the conference Freshman of the Year award and helping West Virginia Tech reach the NAIA Elite Eight, the Madrid native transferred to the University of California Santa Barbara (UCSB). Tellechea scored zzfour goals and provided three assists in his debut season for the Gauchos. His 11 points ranked second-best on the team. Tornio came to Hartwick College after an impressive youth soccer career that saw him play for some top clubs, including a short stint with playing for S.S. Lazio's reserve squad in the summer of 2016 in Italy. He played in 15 games for the Hawks in his freshman year, but unfortunately Harwick College downgraded their men's soccer program to NCAA Division III, which led to Tornio's exit. Tornio transferred to St. Peter's University and will represent them this fall. "Marco played as a forward in his club and high school career, however in his first season at Hartwick College he got alot of time at right midfield," said Thompson. "He is a technical footballer who can assist well and create chances for himself." He has great pedigree having played for Manchester City Academy with some of the best young players in the world. He signed with the University of Rio Grande (Ohio), which is a powerhouse in the NAIA. After two successful seasons, he signed with Wright State University and will continue his college career with the Raiders this fall. "Deri is a creative force on the football pitch, with brilliant technical ability when the ball is at his feet," said Thompson. "He is an attacking mid who affords players around him time to compose themselves and make the right runs for him to find. He was the creative spark at a NAIA powerhouse and has the ability to create space for the shot and attracts defenders opening up space for others." Before coming to Farleigh Dickinson, Labovitz had an impressive high school career that concluded with a senior year that earned him the Gatorade Virginia Boys Soccer Player of the Year. He scored 45 goals and dished out 12 assists in just 22 games. Last fall, in his freshman year at FDU, he continued to shine by leading the Knights in goals (7) and earning Northeast Conference Rookie of the Year honors, in addition to being named to the All-NEC Second Team. "Jacob is a true No. 9 with an appetite for scoring goals," said Thompson. "He is a predator in the box and can score many types of goals. He spent his junior year over in Europe learning his trade and that paid dividends. This past season at FDU, he scored nine goals as a freshman proving that he can get the job done against older, more physical players then he was used to in high school. I expect Jacob to push [his FDU teammate, Fredinho Mompremier] Freddy hard for the starting job as the spear point of our strike force." Mansary had an impressive first season at Wilmington University. As a junior, he was a Second Team All-Conference selection after leading the team in scoring with 10 goals and three assists. "Abdul is dynamic and pacy striker who can beat players on the dribble and get behind the back four," said Thompson. "His delivery into the middle is excellent and he provided most of the attacking thrust for Wilmington University this past season. He played at a very high level of semi-pro football in the London non-league scene so he is experienced and we expect him to entertain our fans and torment our opponents this summer." Mompremier, the Nor'easters' 2017 Offensive Player of the Year, is back for an encore after leading the team in scoring. Last year, Mompremier scored eight goals and dished out three assists in 12 league games. He also scored a goal against Junior Lone Star in the First Round of the Lamar Hunt US Open Cup. 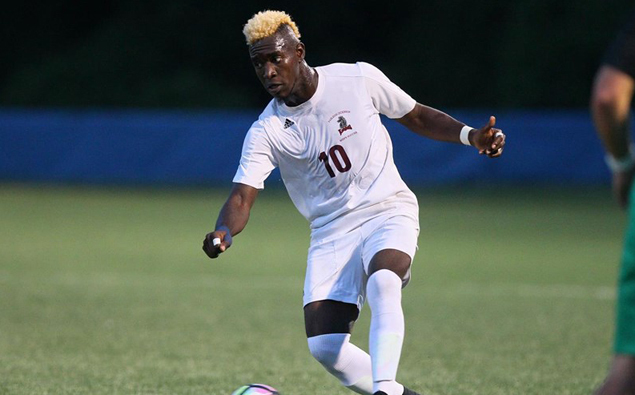 "Fredinho," who has also represented Haiti at the Under-20 National Team level, scored five goals and had two assists in nine games in his first year at Fairleigh Dickinson. Mompremier transferred to FDU after an All-American sophomore season at the University of Tampa. “'The Haitian Sensation' is a strong and powerful central striker who was our top scorer last season," said Thompson. "If Freddy can focus in on his strengths and play to them, he can score 15 goals in the PDL this summer. He started the season off at FDU on fire with 5 in 5 games before he was bitten by the injury bug and was just limited to nine games. Watch out for an explosive season from Freddy, I think the best is yet to come from this lad." Raiola was a big part of another winning season for the nationally-ranked Grand View University (Ia.) Vikings. The Italian was an NAIA All-American, earning honorable mention honors for a season that saw him produce 13 goals and dish out nine assists. "Simone has a well-rounded game, he can pretty much do it all in the opponents' half," said Thompson. "He is a creator, a finisher, a footballer, a distributer and is tactically savvy. He has gotten better and better each season at Grand View University and we are blessed to have a player of such quality come to Ocean City this summer. Simone is a footballer who can bring players into the game and make those around him better players, like most Italians he plays the game simply and elegantly." Born in Chapel Hill, Rose is one of three University of North Carolina players to join the Nor'easters for 2018. He played in just five games for the ACC powerhouse last year during his freshman year. He scored his first colleagiant goal at home against Rutgers University. Rose chose the Tar Heels after being a highly-touted recruit coming out of high school where multiple media outlets had him ranked in the Top 35 (as high as No. 7) among all players in the country. He scored 90 goals in four years with the Capital Area RailHawks Academy in North Carolina and was called up to the U.S. Under-19 National Team in 2016. "When Alex sees more playing time at UNC, he is going to show that he is one of the team's best finishers," said Thompson. "He has a good shot at the starting No. 9 job next season and his finishing ability was spotted by the national team staff and spent time with the U.S. Under-19 National Team. Alex was one of the top recruits in college soccer last year and needs this summer to continue his upward progression in football and Ocean City want to see him bring his goalscoring exploits to the “Beach House” this summer.